NOTE: Your system may look different than pictured below, and may have a check valve on the return line rather than an isolation valve, especially if installed in 2014 or later. Please call if you are unsure. Pool plumbing can be confusing. Solar pool heating valves can add to that confusion. 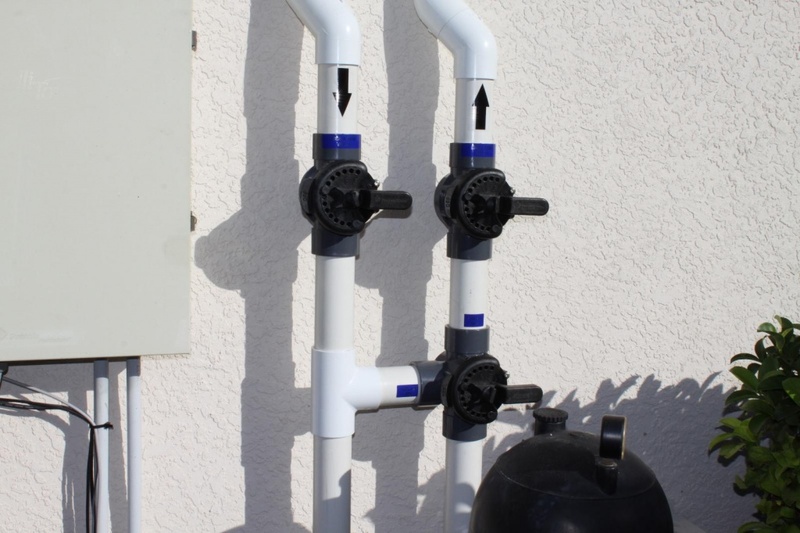 If you want to learn how to turn off and isolate your solar pool heating system with manual valves, you’ve come to the right place. The images and videos below show you how to turn the valves correctly to change the flow of water in your system. 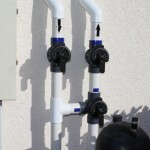 What’s pictured below is what we call a solar pool heating manifold. It is a system of valves to bypass and isolate your system. 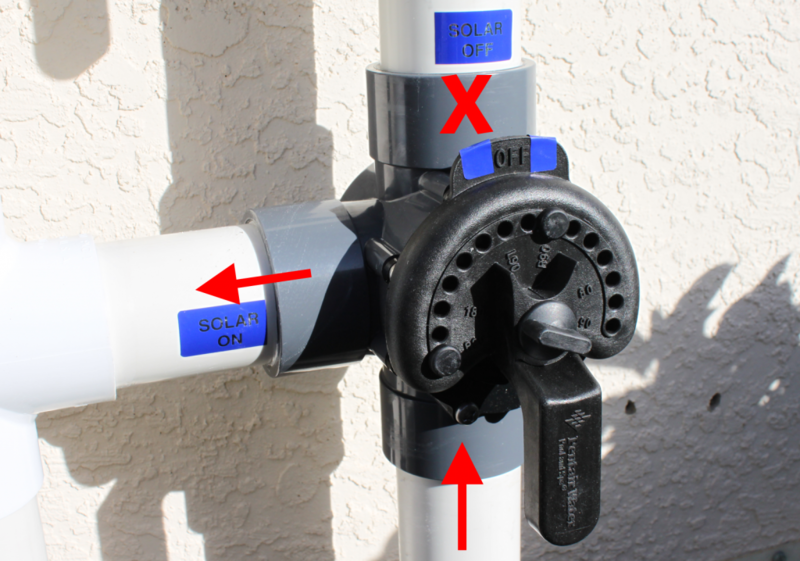 To prevent pump damage, you must bypass the solar loop before isolating the system for service or repair. This article focuses on high-quality two-way and three-way valves. It applies to valves made by Pentair, Praher, Jandy, and Hayward – all work basically the same way. Note that this does not apply to basic red, gray, or blue handled ball valves, which are far inferior to the valves shown. Ball valves have different handle orientations, so this article should not be followed for those systems. (Click for Larger Images) Note – this manifold is shown with the 3-way valve on the right. In some systems this will be flipped and the 3-way valve will be on the left. The concept is the same, but you may click here for left bypass images. In this position, water is travelling through the 3-way valve to the solar panels and returning to the pool. In this position, water is bypassing the solar, turning solar heating off. In this position, water is bypassing the solar, turning solar heating off, and the isolation valves are closed, ensuring that no water can pass to or from the panels. It is critical that your 3-way (bypass) valve be in the proper position before isolating your system. Otherwise, the water would have nowhere to go, and you pump may be damaged. Here is a video showing the procedure to go from solar on mode to bypass mode to isolation mode. For more information on how these valves work, here is another video. Note that the OFF tab on the valve handle always points to the pipe that is blocked. Your system may or may not have labels, but the important thing to remember is that the OFF tab is where the gate that stops water flow is located. In the picture below, the solar panels are bypassed, and water is returned to the pool without going to the roof. Your valve configuration may be different, on the ground rather than the wall, or may not contain all of the pictured valves. If you have any questions about how to turn off and isolate your solar pool heating system, call us at (239) 491-8010.